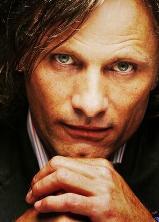 Viggo Mortensen travels light. He might be an actor with an international reputation and an ardent fan base, but he is in Australia on his own, without an entourage, a publicist or an assistant. What he has brought with him, however, is a football banner. It's draped over the TV in his hotel suite, and he takes it with him to a Q&A screening later that day. It's the red-and-blue of his soccer team, San Lorenzo, an Argentine club he has supported since childhood. Mortensen takes his passions as seriously as his work, and he can talk fluently, at times almost unstoppably, about the things that interest, move, unsettle and provoke him. Amid the seriousness, there's a light touch, however, a quiet sense of the absurd, a rueful self-awareness. He has come to Australia on a publicity tour for his new film, Good, in which he plays a German professor of literature in the 1930s who finds himself, little by little, seduced by the Nazi Party. It is based on a play by the late British playwright C. P. Taylor that was first performed in 1981. Mortensen saw the production at the time. "I was in London, for an audition for a part I didn't get, and I went to the Donmar Warehouse to see this play, because it sounded interesting. And it was." Two others who saw the show at the time were even more galvanised by it. Producer Miriam Segal, then a student, was determined to bring it to the screen. Actor Jason Isaacs -- best known as Lucius Malfoy in the Harry Potter series -- also became involved. More than 25 years later, the film was finally made, with Brazilian director Vicente Amorim. Isaacs served as an executive producer, and also plays the literature professor's best friend, a Jewish psychiatrist. Mortensen says that what attracted him to the role -- apart from positive memories of the play -- was that the film seemed to be breaking new cinematic ground in its portrayal of Nazi Germany. "It has become a genre, in a way, almost as much as the Western," he says. "There are conventions, some of which stray from historical fact" -- ranging from the use of a German accent to the expectation that there will be some kind of redemption or catharsis -- but Good, to him, "is a more personal, more intimate" account, a depiction of the way "a descent into brutality or taking the wrong path can happen quite gradually. And the circumstances in which horrible things can happen is often quite normal. The sun can be shining. It can be so mundane that it can almost be dull." Mortensen's character, John Halder, lectures on Proust and writes fiction. He is a busy man, juggling work and family responsibilities: his mother is ill, his wife is disengaged from the home and the children, and, at the university, the political turbulence of the time is starting to impinge on his consciousness. It seems at first, however, to be little more than a temporary irritation. Halder has written a novel whose subject matter -- he explains it, later, as "the story of a man who kills the woman he loves" -- brings him, in early 1933, to the attention of the Nazi Party. He is summoned to party headquarters. He's unnerved at first, convinced he's done something wrong. He's relieved to discover that's not the case; instead, he has been brought in to be flattered. In private, Halder is scathing about Hitler, convinced that he's a buffoon whose days are numbered. His wooing by the party is gradual; for a long time he allows himself to maintain the illusion that he can keep the party and its activities at arm's length, even as he is drawn closer to it and more deeply implicated in its activities. To play Halder, Mortensen prepared himself in various ways. He is quick to recommend What We Knew, by Eric Johnson and Karl-Heinz Reuband, a book of interviews with Germans from every walk of life who lived through the Nazi era. He also found that, on a personal level, there were preconceptions he had to face. "I had to do research into what it is to be a German," he says. "And to be honest with myself, and to do a good job, I had to confront something that I realised was a prejudice. I had a slight aversion to the sound of the German language. I needed to look at that, and by looking at it, even for a little, it started to dissolve." His problem with German, he says, wasn't just that his Danish family members had occupation stories from World War II: it grew out of prevailing cliches he had absorbed, and the kind of cinematic stereotypes that he believes Good resists. Mortensen was born in the US; his father's family is Danish and he was brought up for much of his adolescence in Argentina (where, among other things, he became a San Lorenzo supporter). He speaks several languages, including fluent Spanish, and has appeared in Spanish-language films. Even then, he likes to further refine his linguistic skills. For the 2006 movie Alatriste, for example, he spent time in the remote Northern mountain district of Spain where his character came from. For his role as a Russian gangster in David Cronenberg's Eastern Promises, for which he was nominated for an Academy Award, he went to some trouble to ensure that the Russian he spoke was idiomatic and convincing. In Good, he didn't actually have to speak in German. In fact, one of the features of the film is that the characters all have English accents, a decision Mortensen is strongly in favour of. Yet to tackle the character of Halder, he learnt some German; partly to confront his preconceptions, partly so that, in the scenes in which his character writes letters or notes on the blackboard in German, he could readily do it himself. He also immersed himself in the intellectual world Halder would have been part of. He tracked down "the sort of books that kind of person would have in his library at that time. Not just German books in German, but Proust in French, and American and Scandinavian authors whose books he would own. "And just by opening that door, by going into a bookshop and talking to someone, and they say 'have you seen this?' -- not just a book, but it could be a print or a woodcut -- and then they tell you stories, and send you to a guy down the street ..." More stories, more details, more immersion. He took himself, too, to concentration camps and sites; sometimes, he says, to places where barely any trace of the horrors of the past remained. It happened, he says, that this journey took place in summer, "so it was helpful to me to go to those places and see them in good weather". He carried his camera with him. As well as an actor, he is a painter, poet, musician and photographer, and he has published several books of his images. The pictures he took at the camps, he says, are accompanied by captions -- Treblinka No. 1, Auschwitz No. 2 -- but they are pictures of clouds. This notion, that terrible things can happen in an atmosphere of calm or banality, is not only an important element of the film for him, it is also an aspect of its contemporary relevance. Mortensen, 50, did several years of theatre -- including an award-winning role in Martin Sherman's Bent, the celebrated play about the treatment of homosexuals during the Holocaust -- before he started making films. He had a breakthrough role in 1991 in The Indian Runner, Sean Penn's directorial debut; before and since, he was often cast as a heavy. He was in Gus van Sant's remake of Psycho; he played Nicole Kidman's American suitor in Jane Campion's The Portrait of A Lady. In the Hitchcock remake A Perfect Murder, he played an artist hired by a jealous husband to kill his wife. He wasn't director Peter Jackson's first choice to play Aragorn, the heroic centre of The Lord of the Rings, although it is hard to imagine anyone else in the role. The success of the Middle Earth juggernaut has had a mixture of consequences for Mortensen: it has resulted in the pressure of celebrity and the freedom to make some interesting choices. One of the things it has also allowed him to do is set up a publishing venture, Perceval Press, devoted to bringing out interesting work that might not otherwise have an outlet. He's keen to get back to work at Perceval. Books on the horizon include an anthology of recent Argentine poetry, a book about the fate of mustangs (he is passionate about horses) and an imaginary atlas of future states of America. He might travel light, yet he has some extra baggage in Melbourne. It turns out that he is a Collingwood supporter. The young Australian actor Kodi Smit-McPhee, who made a memorable debut in Romulus, My Father, recently worked on a film with Mortensen, The Road, the post-apocalyptic drama based on Cormac McCarthy's novel. "Kodi told me," says Mortensen, "that I should support the Magpies" and he's doing so as publicly as he can. Right now, he's wearing a suit and polo shirt with the Magpies logo, and it looks as if he doesn't mind, in fact as if he positively enjoys, the strong reactions that Collingwood provokes. "I'm keeping my promise and honouring Kodi and having fun because I know some people will be annoyed by it." He keeps track of San Lorenzo wherever he is. "When we were shooting Good in Budapest, the team had the chance to become national champions of Argentina ... It came down to the last match, and we were shooting a scene that day." Mortensen had his San Lorenzo flag with him, and he would wear his team shirt to work every day, so producer Segal knew of his passion. At the end of the shoot, a group of them went to the bar, and watched the match "and we won. It was emotional and crazy and fun." But winning, he notes, is soon over. You have to begin again. "That's true of sport, or democracy, or marriage, or whatever. It's not a thing. It's a process. Democracy is not a given. There are traditions, there are precedents for people being civilised and having a dialogue, but it doesn't mean they're going to continue." It's true, right now, of America, he says, and we forget it at our peril. It's the lesson of Good, in fact: "Pay attention -- pay attention to yourself" and remember "we are responsible, in the end, for what is done in our name".